Textile wall hanging / construction Stretched holographic Spandex on plywood support. Additional materials include industrial metal and wood parts and expanded foam (hidden from view) mounted upon plywood. 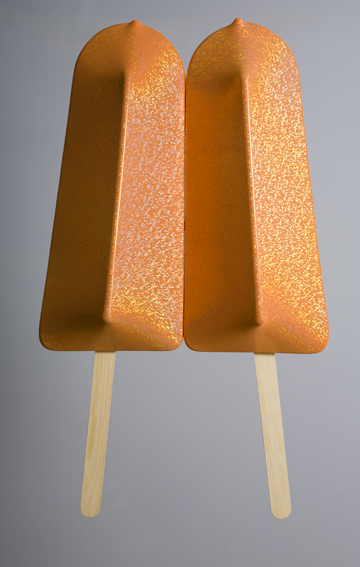 Some survey during World War II is said to have revealed that the ‘popsicle’ was universally acknowledged as a heartfelt symbol of Americana by soldiers in the Allied Expeditionary Forces. This is a double install, and offers many great opportunities for creative lighting, owing to their highly reflective surfaces. Luscious, inviting and sensuous. What more can you desire from a sculpture than to be invited to suckle upon it?